So you wanna be an OGR author, eh? GREAT! DOWNLOAD THIS WEB PAGE as a PDF FILE. We are always interested in receiving layout articles and how-to feature articles from our readers. Good quality photos that accompany the article are a definite plus, and generally will help to increase the chances of acceptance and publication. Anyone who is familiar with our magazine should already have a pretty good idea of the type, quality, and style of editorial content we publish, so the following guidelines apply to actually preparing your material for submission. A text file (MS Word, Wordpad, Open Office, etc.) of 1,200 to 1,500 words. Don’t use any special formatting (fonts, colors, bold, symbols, etc.). 1,200 to 1,500 words applies to layout features. We understand that some how-to features may need to be shorter or longer.Some very basic style considerations that you might want to keep in mind:Use caps and lower case for all text, including titles and sub-titles. Use only a single space after the period at the end of a sentence. Spell check your text file prior to submission.If you include web site addresses in your article, include (and double-check) the full Web address. 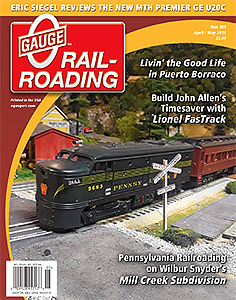 If you are writing a layout feature, you will be providing a word-and-picture “tour” of your layout to our readers. Tell them how your interest in O gauge developed and how the concept for your layout came about. Tell them about the things that you feel make your layout special or distinctive. Also, include important technical details such as type of track used; minimum diameter of curves; type of power/control systems used; and brands of locomotives, rolling stock, accessories, and structures.Don’t be overly concerned with writing style, punctuation, etc.–we’ll take care of that. Just make it a personal and informal account, in your own words, of everything and anything you might want a visitor to know about your layout and your involvement in the hobby. A good selection of quality photographs or other graphics.For layout features, about 15 or so images are usually selected to appear in the magazine. However, we prefer to have a good many more available to choose from. Shoot some wide shots, some mid-range, and some close-up shots of individual features. 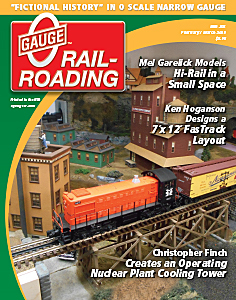 Photos should, whenever possible, include trains in them since we are, after all, a model railroading magazine. Your images must be high resolution. The easiest way to do this is to set your camera to shoot the largest image it is capable of, at the highest quality setting. Even older digital cameras of 6+ mega-pixels will work fine if set this way. On-camera flash should NEVER be used. Never…ever! Images shot with an on-camera flash are not suitable for publication. Use of a tripod is strongly recommended. We look for photos that are properly lit, sharply in focus, have good depth-of-field, are nicely composed, and have an easily distinguished primary subject. Captions can be written after the final images have been selected for publication. We’ll send you a contact sheet of the images we plan to use so you can provide caption information. A track diagram is needed for all layout features except modular layout articles. This diagram can be hand-drawn, if necessary, and does not have to be a finished and “polished” product. Our design team will create the final version of your payout diagram for publication. The overall dimensions of your layout – length and width – should be noted on the diagram, and any major layout features should be labeled, particularly if they are referenced in the text. A photo of the author/builder is also needed for all layout features. Author biographic information is needed for both layout and how-to features. For layout features we need a couple of paragraphs of biographic information about the builder/owner. This can include anything the author cares to relate about himself. It can include career, other hobbies or interests, club affiliations, civic activities, education, and that sort of thing. For how-to articles, a single paragraph of biographic information is normally adequate. Be sure to retain a backup copy of everything you send to us! We are not responsible for materials that may be lost, and submitted materials are not returned to the author. We pay upon publication. We pay our authors $400 for layout features and $200 for how-to features. We will provide with 12 free copies of the magazine to layout feature authors We will provide 10 comp copies to authors of how-to articles. Please contact Editor-In-Chief Allan Miller or call 800-980-OGRR (6477) if you have questions.